A Florida officer is recovering in a hospital after a 38-year-old man dragged the officer for about a half-mile from the door of his car Tuesday morning, according to police. Thomas Cabrera, from Pembroke Pines, FL, is facing a charge of attempted murder of a law enforcement officer for the incident, which was caught on body camera video. 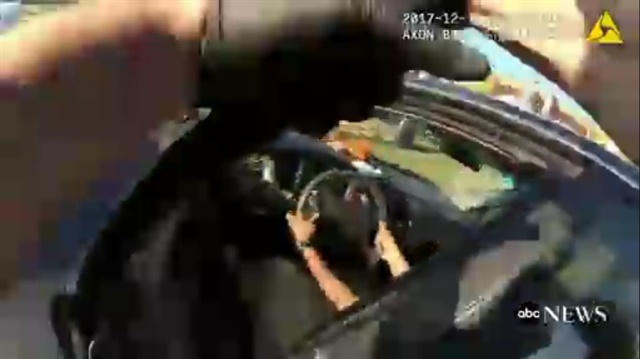 Jon Cusack, a 19-year veteran of the Pembroke Pines Police Department, can be seen in his bodycam video clinging to the driver's side door as the driver speeds off, eventually reaching 60 mph, according to the police report. The driver attempts to ram a fire emergency vehicle, all while Cusack clings to the door, before he releases his grip and tumbles to the side of the road. Police said Cabrera then led officers on a chase, reaching speeds of 100 mph and even using heroin while driving, according to the police report, before he was eventually apprehended in busy morning traffic on I-595. The officer suffered road rash over much of his body, and the soles of his boots were completely worn off, but he is expected to make a full recovery, ABC News reports.